The sponsored product is part of the Nestlé Waters portfolio, and is an "official partner" of this year's London Marathon, which is itself named after a financial service. 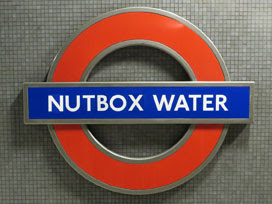 Nestlé have paid £110,000 to have branded artwork placed across the station and all the roundels temporarily replaced with the brand name of their choice. The replacement affects the Jubilee and Overground platforms, and has been professionally done - there are no tacky stickers here. Even the line diagram at the foot of the escalator has been modified for the day, lest you forget where you're supposed to be. Two of the nameplates outside the station have been left alone, but the tall white interchange signs by the bus station have been rebranded, replacing Canada with the name of a town in Derbyshire. 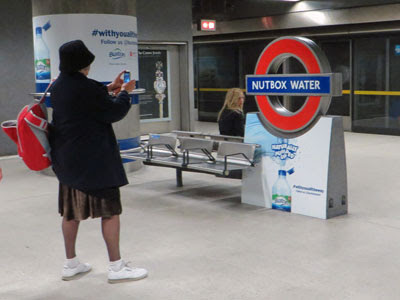 Meanwhile passengers entering the station are greeted by cap-wearing agents dispensing very small bottles of the sponsor's water, sometimes more than once if they're particularly keen. Information on dot matrix indicators advises customers that "the name change is part of a one day sponsorship deal", and urges them to join in with the promotion by tweeting the specified hashtag. Meanwhile a regular platform announcement, delivered by a much chirpier voice than usual, manages to namecheck the sponsor five times in less than thirty seconds. TfL have been slightly defensive about the move, aware that not everyone thinks this is a commercial step they should be taking. The revenue TfL will receive from the deal is part of its wider commercial plans to generate £3.4bn in non-fare revenue over the next decade, which will be reinvested in to improving London's public transport and road network for the benefit of customers and users. Equally, someone in TfL's press release department managed to sign off the following sentence, which suggests that the generation of PR drivel is alive and well on the Jubilee line. The partnership combines two famous brands to celebrate one of the largest and most prestigious marathon races in the world and has been designed to enhance the experience of customers using the station on the day, whilst raising awareness of drinking enough water on the go. Tube maps elsewhere in London have not been adjusted. 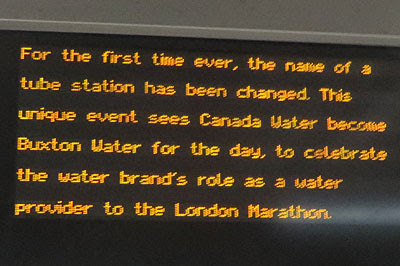 Indeed were it not for the torrent of wider publicity, only passengers using Canada Water station today would have noticed. Instead the brand name has been splashed across the media since the announcement midweek, allowing Nestlé to get maximum exposure for minor outlay, and I'm sure other companies will be queueing up to have a go. Oh how we laughed back in 2006 at the idea of the Sponsored Tube Map. But now alas, thanks to Middle Eastern airlines and Gatwick-based drinks companies, that tarnished reality is upon us. I understand that TfL's bosses are (currently) unwilling to go beyond a 2-day renaming, so the chances of a station being permanently vandalised are (currently) nil. But expect a lot more of this sort of commercial contamination of our public services in the future, because at £110,000 a day it'd take 85 years of station sponsorship to rake in the £3.4bn TfL needs to raise to meet funding gaps. Or, and I know this is unfashionable, perhaps we could just put fares up by a few pence? It'd cost us a lot less than the price of a bottle of water, after all.